#12x Russ Crawford and #30 Daniel Weicht. 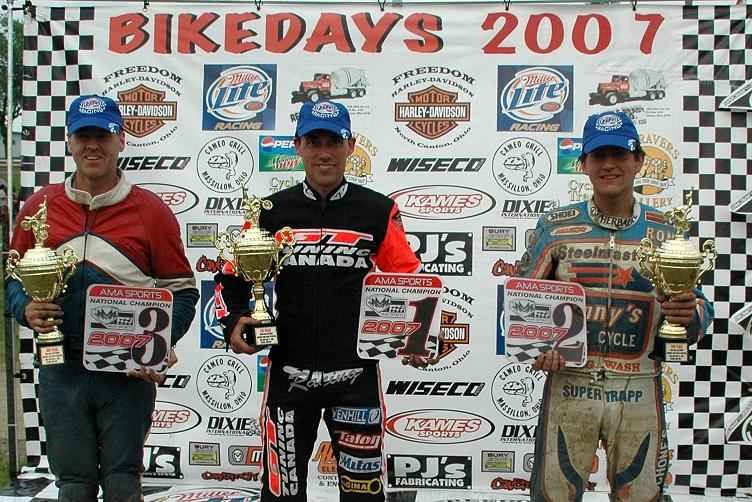 AMA/USA Speedway Long Track National Champions 2007. #1 Jeff Orosz, #2 Chad Rall, #3 Russ Crawford. 2007 AMA/USA National #1 Jeff Orosz. Jeff Orosz of Ontario, Canada took home the AMA/USA Speedway Long Track Championship, the national number one plate, and the lion’s share of the $3,000 purse over Memorial weekend in Canton, Ohio. The required eighteen-man field of speedway riders gathered at the Stark County Fairgrounds during the annual “Bike Days” event for the National. The race format consisted of a series of heats and last chance qualifiers advancing riders to the semi-finals, then transferring the top three riders from each semi directly to the final. In the first round, heat one was taken by #119 Alan Rush, of Speedway, IN; the second heat was won by #31 Jeff Orosz, of Ontario, CAN; and the third heat winner was #82 Chris Hathaway, of Syracuse, IN. In the second round, top finisher in heat four was #52x Chad Rall, of Engadine, MI; heat five #52c Dan Crawford, Marlette, MI; and heat six #31 Jeff Orosz. In round three, heat seven was won by #12x Russ Crawford, Brownstown, MI; heat eight #26 David Weicht, Pierceton, IN; and the ninth heat was won again by #31 Jeff Orosz. After the heats a fierce storm passed through the area, bringing high winds and rain. The grandstands at the Stark County Fairgrounds are covered and race fans didn’t mind the delay as they watched the drag trucks (each displaying double American flags in honor of Memorial weekend). The Bike Days track crew brought the “all weather” limestone track back to superb condition. The racers and the fans agreed that after the downpour, the race surface proved to be smooth and faster than ever – making for great racing. In the Last Chance Qualifying Rounds, the winners were #26 David Weicht and #52x Chad Rall. The first Semi Final Round winner was #31 Jeff Orosz with #12x Russ Crawford taking second and #30 Daniel Weicht taking third for the final transfer position. Semi Final Round Two was won by #52x Chad Rall followed by #82 Chris Hathaway and third by #11 Jim Terchila. With the semi-finals in the book, the stage was set for an exciting Main Event. #31 Jeff Orosz got off to a great start and led from wire-to-wire with second place going to #52x Chad Rall, son of AMA Hall of Fame rider Ronnie Rall, who finished eighth over all himself. #12x Russ Crawford took his Jawa Long Tracker to finish in third place. Fourth place went to #30 Daniel Weicht. Fifth place belonged to #82 Chris Hathaway. The wrap-up position sixth place went to #11 Jim Terchila. “This was the first Speedway Long Track National East of the Mississippi,” said Scotty Brown, promoter of “Bike Days” and former world ice racing champion. Brown will continue to run the National during the annual two-day Memorial weekend event in Canton. 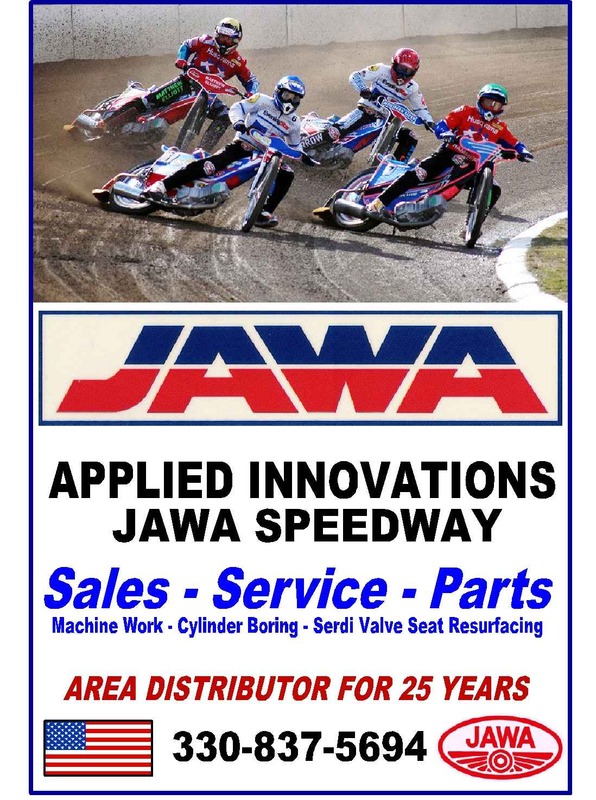 The next stop on the “Bike Days” Speedway Long Track calendar is the AMA/USA Ohio Long Track Championship, scheduled for Friday night, July 20 the Fulton Co. Fairgrounds, in Wauseon, Ohio. The championship takes place during the 25th annual Antique Motorcycle Club of America’s national meet. That evening’s race will also include Vintage classes on the half-mile track. Go to www. bikedays.com for more information.